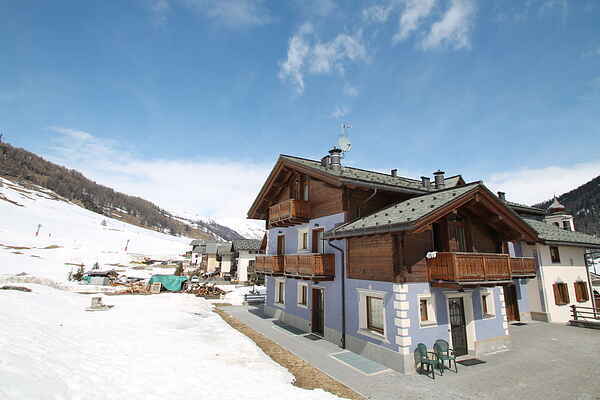 The house is located in the district of Florin, at just 50 meters from the ski lift Palipert that is connected to the Carosello 3000 gondola. In the immediate vicinity you will find bars, supermarkets, grocery, butcher shops, restaurants and nightlife. The free ski buses stop near the house with the blue, green, red and yellow lines. Cross country skiing is possible at only 100 meters away. The house has seven apartments of different sizes. The apartments are spacious, the rooms are bright and well furnished. The house is newly build and located in a quiet area with little trafic. In the center of Livigno, just 3 kilometers away, you can immerse yourself in the atmosphere of the most famous fashion brands. In addition to shopping, you can also enjoy a relaxing stroll on the walking paths, ideal for nature lovers.